The Colorado Springs Marathon presented by Penrose-St. Francis, is a community running event that features a full marathon, half marathon, and 5K, beginning & ending at Acacia Park in downtown Colorado Springs. The course will showcase the city of Colorado Springs by taking runners on Wood Ave, Cascade Ave, Platte Ave, past the Fallen Fire Fighter Memorial, through America the Beautiful Park, Monument Valley Park, around Memorial Park, by the Olympic Training Center & through downtown. 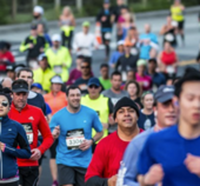 This family friendly race is a premiere endurance running event, attracting people from 26 different states. For the event’s third year, organizers have introduced a full marathon distance for our more ambitious runners! Essential to this growing event is the 300+ volunteer team that works tirelessly and enthusiastically to support our athletes. There are many ways to get involved with the Colorado Springs Marathon, Half, 5K, and Kids K and this is your first step. All jobs are fun and interactive. Every volunteer will receive a souvenir event t-shirt and a goody bag with snacks and sponsor goodies!